I love ricotta, but I’ve never had truly fresh ricotta, so I decided to make my own. It requires very little time, no special equipment, and few ingredients, so I was able to prepare it one evening, then drain it over night for use the next day. I had no idea what I might make with it once it was finished, but that’s the story of my life right now. How bad could it be to simply nibble on fresh ricotta sprinkled with sea salt and perhaps a drizzle of fruity extra virgin olive oil? Of course, sprinkling it over a nice salad could be fabulous as well. Perfectly simple, right? Simple seems never to be in my repertoire. 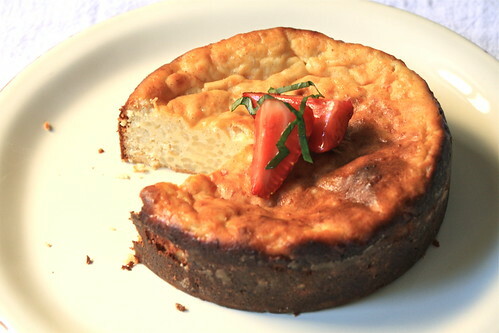 With less than a week until Easter and no real plans for a holiday meal in the works, I decided to look for dessert recipes that included ricotta and almost immediately found quite a few for a traditional Easter Pie, or in some cases, Pasteria. It’s like a cheesecake, but it’s made with ricotta and grain. Although the grain is most often wheat, some recipes use rice. Others are made with a crust and latticed top — but some are completely without either — and leave it to me to make one in the least traditional way possible, lacking crust, wheat, and candied fruit. This small dessert is perfect for spring, or when berries are at their best. Line a large strainer with 4-5 layers of cheesecloth over the sink (or a bowl if you’re planning on saving the whey). In a large saucepan over high heat, mix both types of milk, stirring to keep the mixture from scalding. When steam begins to rise from the mixture, stop stirring. You should begin to see curds rise from the mixture. Gently use a spatula to slowly scrape the bottom of the pan to dislodge any curds which may be attached to the bottom. Check the temperature of the mixture — at 175 degrees F, the curds will completely separate from the whey. Remove the pan from the heat and using a slotted spoon or wire scoop, gently remove the curds to the prepared strainer and allow to drain. Allow to cool to room temperature. For a more moist, creamy ricotta, use immediately. 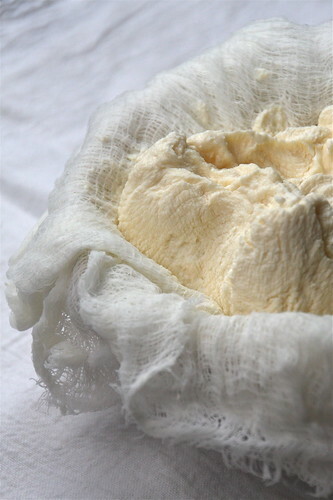 For a more firm ricotta, gather the ends of the cheesecloth and without squeezing, twist or tie them together. Tie the bundle to the handle of a wooden spoon and suspend it over a bowl in the fridge over night. I used raw milk and cultured buttermilk, but you don’t have to. If you’re interested in the controversy surrounding raw milk, here’s a recent piece in the NYTimes that will catch you up on things. Because our lives are hectic at this time of year, I ended up not using the ricotta for 3 days and it was just fine: firm, but still moist and flavorful. To store, leave it wrapped in the cheesecloth and place it in a well-sealed container. Many thanks to 101 Cookbooks for the inspiration and homemade ricotta recipe from which mine was adapted. 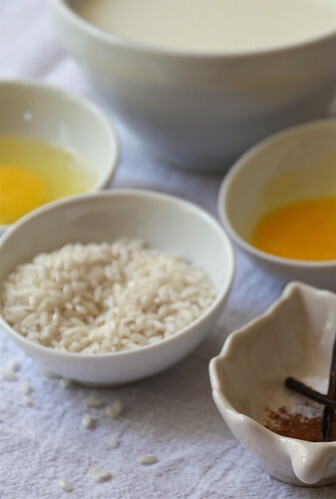 Heat the milk and stir in the rice, cinnamon, and salt in a small sauce pan. Scrape the seeds from the vanilla bean and add to the mixture in the pan along with the bean. Cook over low heat, stirring occasionally, until rice is tender and all the milk is absorbed, approximately 20 minutes. Stir in 1/4 c. of the sugar and let the mixture cool. 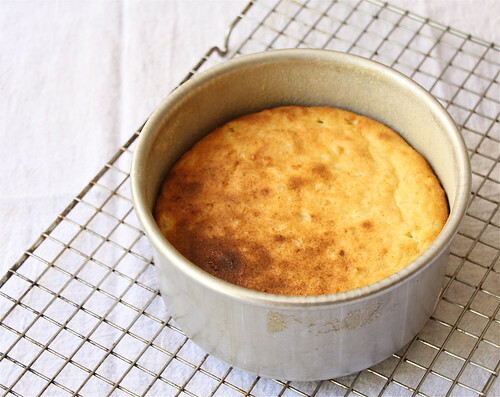 Heat the oven to 350 degrees F. Using a 6″ cake pan with a removable bottom (or a springform pan), coat with olive oil lightly, and then give a dusting of flour. Set aside. 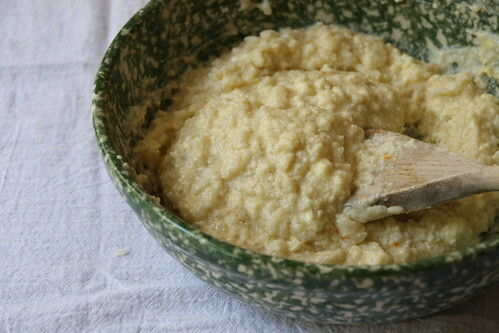 In a medium bowl, stir the ricotta, eggs, remaining 1/4 c. sugar, tangerine zest, and cooled rice mixture until well blended. Pour into the prepared pan and bake until golden on top and the center is nearly set, about 50 minutes. Cool in the pan for about 10 minutes, then using a sharp knife, score around the edges before releasing it from the pan to cool completely on a rack. The cake will sink as it cools. If not using immediately, wrap well and refrigerate. We liked the rice in this. 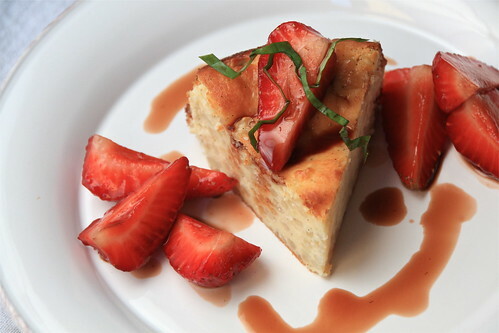 It has a completely different texture and taste than cheesecake, and is very pleasant. It’s sweeter than I thought it would be, but not extremely sweet. Having tried this now, of course I want to make a more traditional version with wheat and a latticed crust. Honestly, I’d never have used the fresh ricotta for this if it hadn’t been in the fridge for a couple of days. Why bake fresh ricotta? 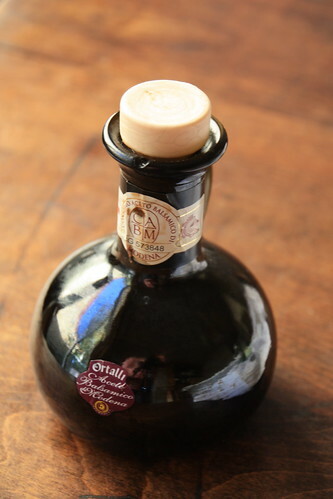 If it wasn’t for the balsamic strawberries (see below) this would have been on the mellow side as far as dessert goes. But I enjoy rice pudding and bread pudding, so I’d categorize it with those. For additional versions of Neapolitan Easter Pie, see Buff Chickpea, or Our Italian Table (whose recipe influenced mine), both of whom have recipes inspired by Martha Stewart’s version. For a more traditional version of Pasteria, see this article in the Chicago Tribune. In a small sauce pan, stir the vinegar, orange juice, and 2 tsp. of sugar until sugar dissolves. Bring to a boil over medium high heat and cook until it reduces to about 1/4 cup. It should be somewhat like a syrup. Remove from heat and allow to cool. 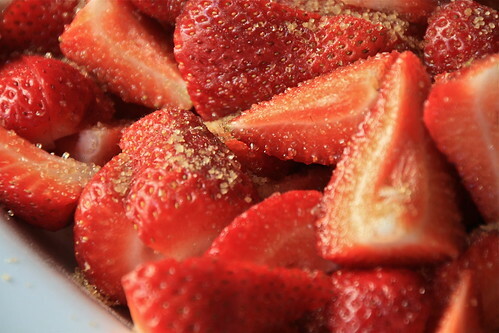 While cooling, hull the strawberries and quarter them. Sprinkle the remaining sugar over and toss lightly. Set aside. When the syrup has completely cooled, pour over the strawberries, and lightly toss. Sprinkle in the basil just before serving. 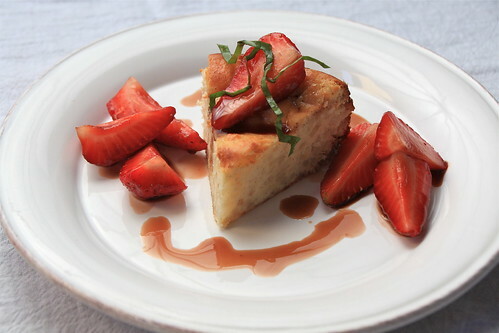 There are varying recipes for balsamic strawberries as with most other recipes, but this one, adapted from an Epicurious recipe, is fabulous. In fact, if you watch it carefully and the heat is very low, you can reduce the vinegar down to something quite decadent that still works well with the berries and basil. 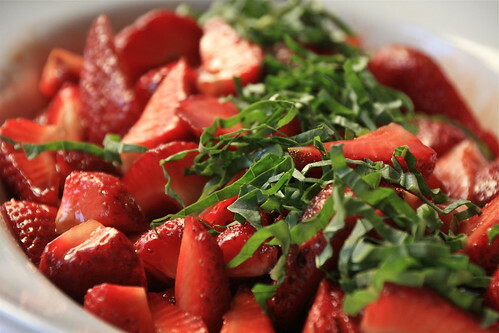 The peppery taste of basil with the sweet berries and tang of the balsamic reduction is very satisfying. 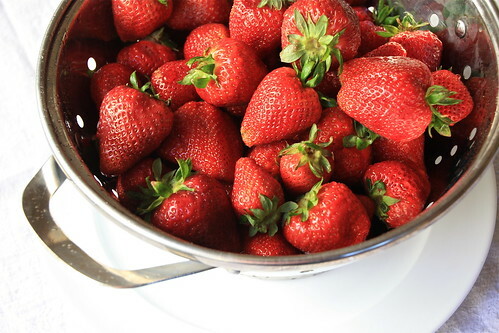 If you’re not sure about whether it’s a flavor for you, don’t mix the balsamic into the strawberries. Just drizzle a bit over. To serve the dessert, plate a slice of the pie, top with berries, and spoon a bit of the syrup over.